Welcome to the new Blue Garter! We’ve moved to WordPress and worked up a snazzy new banner – huge thanks to gleek for her expertise in that department. She’s also responsible for those adorable sheep dividers. We’ll be adding more content here over the next few weeks, so keep an eye out for new stuff! That’s swag stitch on the shoulders, and a simple diamond pattern of purl stitches I made up for the back. I decided to use ribbing instead of seed stitch for the cuffs, hoping it would draw in a little more around my less-than-bulging biceps, and I chose a 2 x 3 rib so it would match up with the swag stitch. I also thought that introducing seed stitch might give a little more of a “sampler” effect than I wanted, since I’d already dressed up the body of the piece. 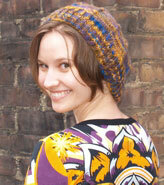 I finished in about three days, making this a very quick and rewarding knit. Heck, maybe I’ll even wear it to my cousin’s potluck tonight just to get a little more use out of it. We’re certainly having the weather for it. But don’t count on seeing any more shrugs up here, okay? One is enough! Now I’m off to put away some boxes of clothes and work the toe decreases on my Dalarna sock. And then we’ll see how well the wire hangers work for sock blocking. I promise I’ll document the process for you. the site looks great!!! lightbox is really cool. what a fantastic plugin! congrats! Love the new site. Love light-box. 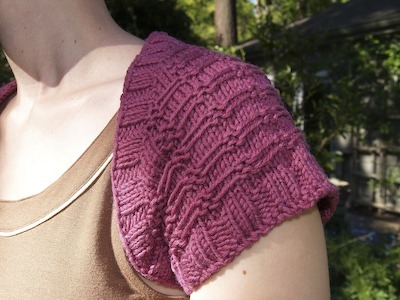 Love the one-skein wonder. Love, love, love. I miss you!!! I have not made the one skein wonder but I LOVE the way your’s turned out. Lightbox is cool. Your site looks great. I like the swag stitch–great mod! Your new blog home looks great and so does your modified OSW! I really like the new look! The lightbox thing is pretty cool. I can only aspire to have such a fancy blog as you! 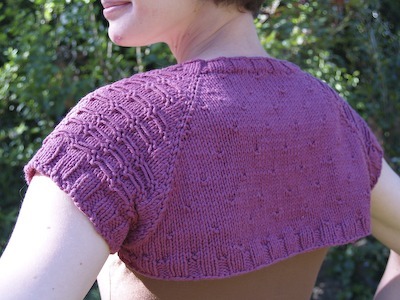 I love the stitch you used for your shrug too! i love the new look! the sheep dividers are so cute and the layout is really snazzy! well done.